What is the legal definition of a road? What is the legal definition of a road? The definition of a road is quite broad. It includes streets, motorways, beaches, a place to which the public have access (whether as of right or not), bridges, culverts, ferries, fords that form part of a street or motorway, and all sites where a vehicle may be weighed for the purposes of the Land Transport Act. The definition includes locations where there are access to operations such as distribution centres with fenced forecourts but when the gates are open. Car parks, wharves, riverbeds, beaches, road shoulders and bridges are included in the definition of a road. Streets, ways, highways, public highways and public roads are simply words that mean a road of a certain kind. A place to which the public have access, whether as of right or not. With them being designated a road it allows NZTA to apply rules to them to keep people safe, restrict certain vehicles and certain usages, and protect certain areas. For example, beaches are specifically included as roads so that speed limits and road worthiness can be enforced. There can often be some confusion over what people think a 'road' is, and what the actual legal definition of a road is. The original definition of a road comes from English common law that was put into practice in New Zealand. A very simple test is used: is there a right of way or right of passage granted to the public by the land owner? It was the permission for public use that was the important part; a legal road could be owned by a private individual but given for use by the public. The modern definition of 'use' means that the public in general must have access, not just a section of them, and that the road must be being used by the public. Once you have this rule then you can prevent people from interfering with the rights of road users to use the road and travel from one place to another. Carriageways - for use by pedestrians, animals and vehicles. Even though roads are fairly well defined now, there are still facets of the law that make it difficult to be black and white about what is a road and what isn't a road in some circumstances. The Acts that define what a road is don't grant rights of access or passage, they simply seek to define what is allowable should the public have rights of access or passage. Your insurance company might have a completely different definition of what a road is. For example, a specific beach might be a road but if you get your vehicle stuck on it and the tide washes through it writing it off, you might not be insured for a number of reasons (driving off-road, driving recklessly, etc) - insurance companies tend to have a large number of exit clauses. Be sure to check your policy if you want to do any 'off-road' driving, especially if it involves driving through streams or rivers. 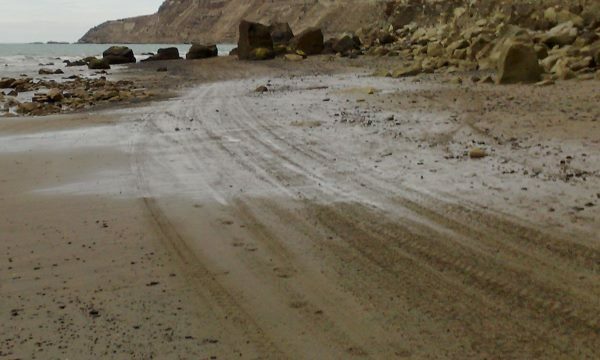 The following image shows part of a beach that is being used by vehicles as a road.